If Old Faithful is historically the world’s most famous geyser, then Morning Glory Pool is surely the park’s most famous hot spring. This has been the case for almost the entire history of Yellowstone Park. 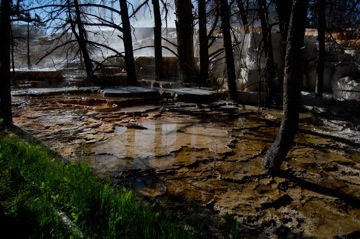 But, like all Yellowstone thermal features, Morning Glory has not stayed the same. 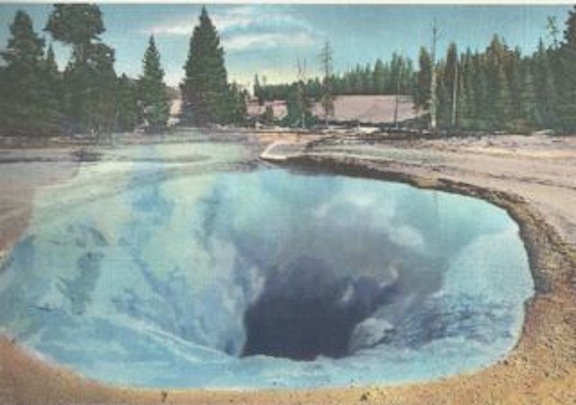 The Grand Loop Road, that famous figure-eight-shaped main road in the park, went within a few yards of Morning Glory Pool (and also of Old Faithful Geyser) until the road’s rerouting in 1969. This proximity to Morning Glory helps explain the pool’s early popularity and also its appeal to vandals. At the time it was named, probably in 1883, the name Morning Glory was entirely appropriate, since it was named for the common garden flower. Its shape was a perfect funnel and its water was a super-clear pale blue color. Early writers called it “a cerulean jewel” and its water “of the loveliest, clearest robin’s egg blue.” The color was due to a water temperature too high for the growth of bacteria or algae, even near the edge. Morning Glory was surrounded by a border of scalloped geyserite as much as 10 inches wide and 5 inches high. Souvenir hunters had managed to remove every bit of this border before Jack Haynes photographed this view of the pool. As more and more tourists passed by closely on the road, many of them also seemed to find it irresistible to throw things in. The pool’s only known natural eruption occurred in 1944, but in 1950 an eruption was induced in order to clean out the vent. Rangers found $86.27 in pennies, other coins, clothing that included 76 handkerchiefs and “delicate items of underclothing,” and items as large as logs, according to T. Scott Bryan’s The Geysers of Yellowstone. By mid century, due to all the vandalism and consequent lowering of the temperature, concentric rings of bright yellow and orange bacteria and algae grew around the blue center, to the point where the name is now not really appropriate. Since the 1970s the road has become an asphalt path for bicyclists and pedestrians. Although most visitors today observe the rules and have the good sense not to throw things into hot springs, cleaning out Morning Glory Pool is still needed from time to time. The temperature also may vary from natural causes, and the colors vary as a result, as you can see from pictures of the pool in successive decades taken by my friend and colleague Suzanne Cane. Contemplating Morning Glory Pool has inspired me to create a list of my favorite 20 easily found hot springs in Yellowstone. 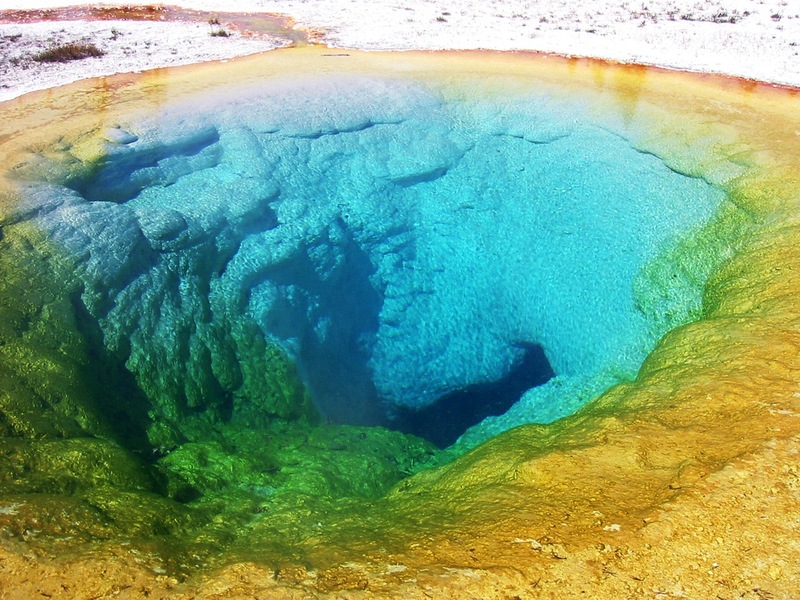 They occur in numerous other areas besides Upper Geyser Basin, where Morning Glory is located. I revisit most of them every time I visit the park. You can find some of them described and pictured in five of the Nuggets on this website, such as in the Itinerary for a family trip nugget or the one about West Thumb Geyser Basin. And gorgeous Crested Pool appears on the cover of our new Visiting Geyserland e-book. I’ll write about some other favorites in the months to come—it will be a delightful memory trip for my off-season months! 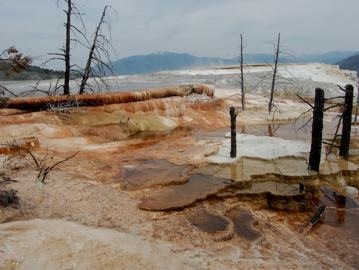 A thermal area in the park that attracts me strongly and that I think is underrated in general is Mammoth Hot Springs. Nineteenth-century visitors were sure it would sometime soon be turned into a spa or sanatorium, but fortunately that didn’t happen. Before soaking in the hot pools became strictly forbidden, lots of people did it. Park hotels did not provide hot showers in those days. Belgian travel writer Jules Leclercq visited in 1883 and experienced “supreme satisfaction plunging into a basin whose waters were an exquisite 30ºC [86ºF]. My bath was a meter deep. The siliceous efflorescence that lined the interior walls seemed like velvet cushions. . . .” until he noticed water in a neighboring basin suddenly rising. It happened that his clothes and towels were in that basin. “The proximity of the hotel consoled me in my misfortune,” he concluded. Lacking a volunteer organization such as the Geyser Observation and Study Association that keeps good track of the geysers in and around the Old Faithful area and Norris, Mammoth-lovers mostly have to find out what is happening there for ourselves. 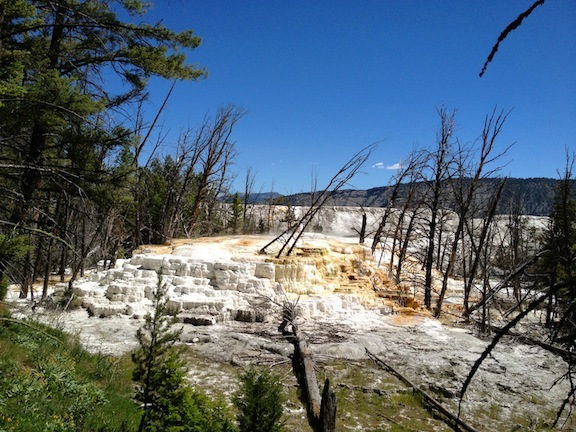 Mammoth’s springs and the terraces they create are always changing. The ones I found most active this August were Grassy Spring and its very new (probably as yet unnamed) neighbor; Canary Spring; and Narrow Gauge Terrace. In the twenty years I’ve been observing it, the hot water activity in Canary has gradually migrated from close to the hillside just below the Grand Loop Road out to the north. Near the steps leading down to Canary is a good place to observe how newer springs can begin to form terraces by depositing a thin layer of calcite ice on top of still, level pools of hot water; with time tiny delicate terracettes form around the pools. Eventually these will build up to be impressive terraces, too—and the boardwalk will have to be moved again! An area not shown on the Yellowstone Association pamphlet map at all but described in Yellowstone Treasures is my other favorite at Mammoth, the extremely active lower terrace formation at Narrow Gauge Terrace. Deeply ensconced in tall trees, the growing terraces are almost impossible to photograph well. It was very dark there in 2009, but my friend Suzanne Cane got a very good shot in June 2013. 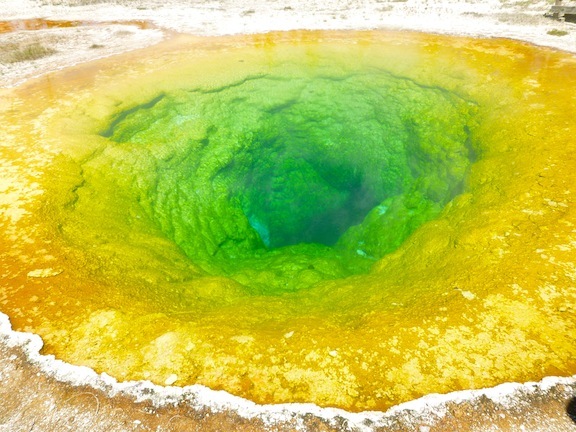 This year, the active springs and color from them cover about 300 degrees of a circle. My Narrow Gauge notes: “Building a throne for itself. One large dead tree fully knocked over at south end. No sound here but the musical bubbling at several pitches from various outlets.” Magical! 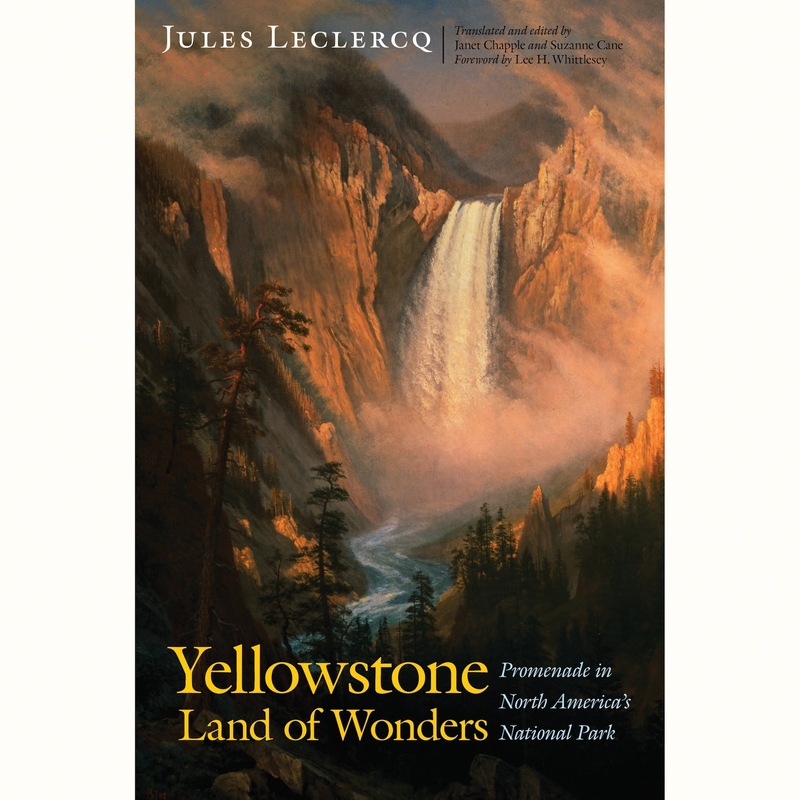 Excellent travel writer Jules Leclercq traveled across the U.S. by train and throughout the then-new Yellowstone National Park on horseback and wrote an engaging account of his experiences. Co-translators/editors Janet Chapple (author of Yellowstone Treasures) and Suzanne Cane (French teacher and librarian) will read some of his revelations and show engravings from his book, La Terre des Merveilles, and contemporary photographs in a series of programs this coming winter and spring: Yellowstone, Land of Wonders. Previous presentations have been enjoyed in Rhode Island, the Bay Area of California, and at Mammoth and Old Faithful in Yellowstone. — Thursday, February 6 at 7pm: Barrington Public Library, 281 County Rd., Barrington, RI. (Suzanne alone). — Tuesday, April 8 at lunch time: The Atheneaum, Benefit Street, Providence, RI. (Suzanne alone). Today I feel like raving about the delights of getting together with family and friends in Yellowstone. I returned about a week ago from a two-week trip that I had been planning (as always) for many months. My excellent companions for the two-day drive to the park and during my stay were colleague Suzanne Cane and her husband David Cane. Suzanne and I worked together for six years to turn out our translation of a travelogue about Yellowstone written by 1883 Belgian visitor Jules Leclercq. You can read about our book, Yellowstone, Land of Wonders, in the Amazon.com entry for the book. Both the Canes took tremendous numbers of pictures, including this one of Beehive Geyser. In addition to David and Suzanne, I was blessed by having two of my daughters, Beth and Karen, and my granddaughter Lexi with me for a few days. At six years old, Lexi is the perfect age to begin what I hope will be her lifetime attraction to and interest in Yellowstone and environs. She participated eagerly in all our walks and expeditions to see many of my favorite places, and was thrilled by Old Faithful and Grand Geyser eruptions. And one of my favorite visual memories is of watching Beth and Lexi and David skipping hand-in-hand down a path. It’s been a long time since I’ve seen a grown man skip! Coming up next month are two events centered around the newly published translation of a really old and fascinating travelog about Yellowstone Park. Belgian travel writer and judge Jules Leclercq visited the park when it was only eleven years old, arriving by train and horse-drawn carriage, and riding horseback in a loop around the park for ten days with a guide. In those early days, that was the only way to see these wonders that had just been set aside by an 1872 act of Congress, establishing Yellowstone as the first national park in the world. Leclercq’s book, La Terre des Merveilles, although published in French in 1886, has never before been fully translated and published in English. He was already an accomplished travel writer at age 35. As one reviewer wrote, he was “enthusiastic, energetic, observant, curious, and companionable.” In addition, he studied the existing literature about Yellowstone and included a great deal of the knowledge he gained in his book. Leclercq describes camping near geysers, washing clothes in a bubbling hot spring, and meeting such diverse characters as local guides and tourists from the United States and Europe. He is aghast at the vandalism he sees around him and advocates for military protection of the incomparable features he describes so aptly. With Suzanne Cane from Rhode Island, I spent about five years translating and annotating the book, which we call Yellowstone, Land of Wonders in English. Now it is available from the University of Nebraska Press and all online and brick-and-mortar bookstores. Suzanne and I will be giving presentations, including showing some of the book’s engravings and related contemporary photos of Yellowstone. We’ll also read a number of our favorite excerpts from the book. Join us at Mammoth Hot Springs Hotel Map Room on Thursday, June 27, 8:30 pm or at the Old Faithful Inn third floor mezzanine on Saturday, June 29, at 8:00 pm. We’ll also be signing books in the Old Faithful Inn lobby on June 29 and 30 from 11:00 am to 6:00 pm. See you there!